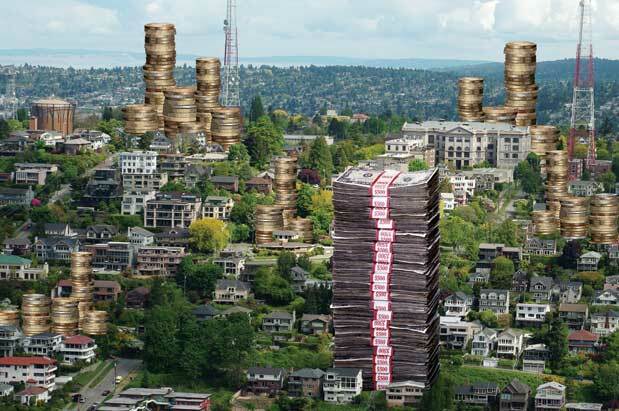 Is it Time to Bring Back Rent Control in Seattle? Rental housing prices in the city are increasing at alarming rates. Time to bring back rent control? Richard has lived in Seattle for 32 years. In 2001, he moved into a small, one-bedroom apartment on Capitol Hill, where rent was $650 a month. In 2013, new building owners made some general improvements and then began raising rents. His bill jumped to $1,000. Then $1,200. Over the course of the next 18 months, his rent increased every few months—which caused many of his fellow tenants to leave, until he was one of only four of the original 30 remaining. “Last month, I wrote a check for over $1,600. I can’t afford it if it goes over that,” says Richard, who declined to publish his last name for fear of causing tension in his building. He lives by himself and works as a server in a restaurant downtown. “It’s very frustrating. This was our home, and we’re being forced to leave." Renters make up 52 percent of Seattle’s population—ask any one of them and he or she will have a version of the same story. According to The Seattle Times, in June, the average new market rate for a one-bedroom, one-bathroom apartment in the Seattle area was $1,284, up $94 since last year. In Seattle proper, that number is $1,445, with rents as high as $1,628 for a similar unit in Ballard. And a study on workforce housing released this spring by the City of Seattle revealed residential rents had increased an average of 9.2 percent between February 2013 and February 2014. This is more than three times the national average and puts Seattle fourth behind comparable tech hubs Austin, San Diego and San Francisco for highest rental hike rates in the nation. An August report ranked Seattle first among 81 cities for fastest rising rents. The result is that workforce Seattleites—teachers, custodians, small-business owners—are scrambling to find affordable rents (widely defined as 30 percent of annual take-home pay), even as cranes appear on every horizon and developers hurriedly prepare for an influx of new residents. For the first time in decades, there is serious talk about rent regulation. Drawing steam from the minimum-wage victory, activists and frustrated renters say it’s time for rent control. But unlike the minimum wage, Seattle can’t go it alone on rent control. Washington banned it statewide in 1981 when, in the wake of President Ronald Reagan’s election and a nationwide rollback of regulation, the state Legislature passed RCW 35.21.830. Under this law, no Washington city can create laws limiting rent for a private rental property, and rent can increase any amount at any time, provided landlords give 30-day notice (60 days for an increase of 10 percent or more). More than three decades later, we’re trying to figure out if this law still makes sense. Socialist candidate Jess Spear thinks not, and has made ending the statewide rent control ban a central tenet in her campaign against Frank Chopp for the 43rd Legislative District spot this year. It’s unlikely Spear will topple the speaker of the House, but the notion of rent control appeals to many who are struggling to pay the rent in Seattle, even those who don’t really know how rent control works. In the 1940s, many cities enacted rent freezes now referred to as first-generation rent controls. They were tied to buildings constructed before a certain year and restricted landlords from raising rents or evicting a tenant: As long as the tenant remained (or passed the apartment to a family member upon their death), the rent could never increase. These are the apartments of lore where a month’s rent costs less today than a steak dinner. By the 1950s, most first-generation rent controls were discarded; today they exist only in New York City, where they account for less than 2 percent of total rental housing. The ’60s and ’70s saw a resurgence of rent controls—including in Seattle—that are called second-generation, or rent-stabilization, laws. These allow for gradual increases based on inflation rates; in most cities still maintaining these laws, they apply to buildings built only before the law took effect (generally the late ’70s), which means the supply of rent-controlled properties is often slim. What Spear means by rent control is the second-generation version tied to inflation and market rates. But she argues that in order for rent control to work in Seattle, it must apply to all new buildings. For many, this is a key factor in avoiding the shortage of rent-controlled units as seen in places like San Francisco. And it’s also where resistance stiffens. The main opposition to rent control comes from those, including economists and developers, who argue it drives away development. Stephen H. O’Connor, director of the Runstad Center for Real Estate Studies at the University of Washington, says that the academic study of rent control and price controls is long and deep, and shows that it’s bad public policy. “The private real estate market will not assume a level of risk that doesn’t provide a commensurate level of return,” O’Connor says. In other words, if regulations constrain potential profits here, developers will move elsewhere. Maybe to Bellevue. Current affordability strategies take three basic forms (along a spectrum from regulation to free market): stabilize or control rent, make developers build or fund affordable units as part of the cost of building, or wait for increased density and expanded housing supply to drive down costs naturally. For her part, Seattle City Council member Sally Clark doesn’t think we’ll see a removal of the ban anytime soon and doesn’t buy the density solution. “The argument is that if there are enough cans of Pepsi, the price of Pepsi will come down,” Clark says. “It may work for Pepsi, but not for housing.” She and others point to Ballard as an example of the failed maximum-density theory, where rental rates (and vacancies) are at a citywide high despite increased supply. Instead, she’s trying to do what she can at the city level, which is to advocate for more affordable housing citywide. With Mayor Ed Murray, she’s created a Seattle Housing Affordability and Livability Agenda, a resolution passed by the City Council in September that sets a time frame for developing a citywide strategic housing plan. She and those working with her are addressing what they see as the deepest crisis of affordability in the city—the population making 30–80 percent of the area median income, an annual income in the range of about $21,000–$52,000 for a household of two. But John Fox, who since the 1970s has manned the Seattle Displacement Coalition, a nonprofit advocacy group that has taken part in every organized rent control initiative in the last 40 years, sees some shortcomings in the direction the city is heading. He worries that restructuring the city’s current menu approach, by which developers can build affordable housing units or choose to pay a fee, will result in less affordable housing. “I could see the council announcing with great fanfare that it has decided to hold developers accountable, when in reality it only takes away the developer’s option to include low-income units in their project,” he says. Instead, Fox calls for widespread one-for-one replacement laws, meaning that for every affordable housing unit a developer tears down, a new one is built to replace it. He is also calling for greater impact fees (fees that help the city pay for public services infrastructure, including below-market housing projects), which he sees as an important difference we can make right now. Is removing rent control limitations at the state level tenable? Fox, who would like to see the ban removed, thinks it unlikely in the short term. “There are a lot of assumptions about rent control that first need to be overcome,” he says.